The Bahamas' Shaunae Miller won gold in the 400 meters by diving across the finish line. Shaunae Miller Won Gold by Flopping at the Finish Line. Is Diving Smart Strategy? Bahamas’ Shaunae Miller dives to cross the finish line ahead of the United States’ Allyson Felix during the women’s 400-meter final at Olympic Stadium in Rio de Janeiro on Monday. The United States’ Allyson Felix was the first sprinter to run through the finish line in the women’s 400-meter final on Monday night. But the 30-year-old American wasn’t the first to cross it. 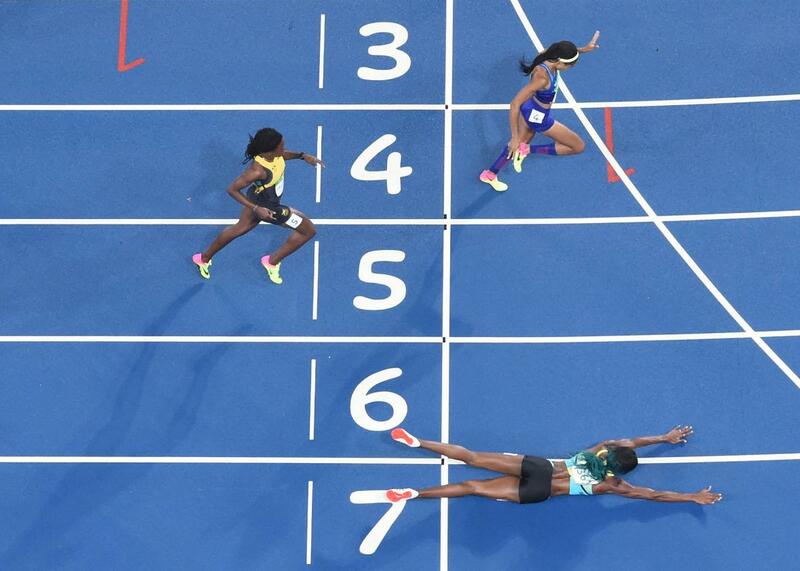 * Shaunae Miller of the Bahamas took gold after she fell—or maybe dove—across the line as Felix stayed on her feet. To the naked eye, it looked like Felix might have won the race—that’s how they called it in real time on ESPN International. But trackside photos show that Miller’s face plant sent the front of her torso across that vertical plane just before Felix scooted across the line upright. Still, legendary 400-meter runner Michael Johnson said he didn’t believe her finish-line flop was intentional. Does diving through the finish line work? U.S. Olympian Lolo Jones says maybe. Watching the replay, it’s very, very hard to tell if Miller would’ve won if she stayed on her feet. According to Ralph Reiff, the executive director of St. Vincent Sports Performance in Indianapolis, Ind., the best way to finish a race is by running—not flying—through the line. That 2012 Runner’s World piece was written after American hurdler Jeff Porter dove across the line at the U.S. Olympic Trials to finish third in the 110-meter hurdles and win a spot on the Olympic team. For his part, Porter said he’d planned his dive in advance. Four years prior to that, at the 2008 Beijing Olympics, American David Neville flung his body across the finish line to edge out the Bahamas’ Christopher Brown to win the bronze medal in the 400 meters. For Bahamians, then, Miller’s win was sweet revenge. Despite getting nipped at the tape, Felix won her seventh career Olympic medal, passing Jackie Joyner-Kersee to become the most-decorated American track and field star. *Correction, Aug. 16, 2016: This post originally misstated Allyson Felix’s age. She’s 30, not 29. It also misidentified the International Association of Athletics Federation as the International Association of Athletic Federation.